This is the original Thunderbird 3, space rocket from the TV show Thunderbirds. I modeled it almost 18 years ago in Lightwave. I found the files, had them converted to Maya and I refined the model quite a bit, including all separate pieces per each color, and reinforcing slots, tabs, and even channels for coat-hanger wires for strength down the arms. Last year, one of the first things I was excited to do with my Afinia H479 printer (which has dropped in price, by the way, so check it out!) was to print a large model of the re-visioning of Thunderbird 3 that I had designed in Lightwave about 15 years earlier. 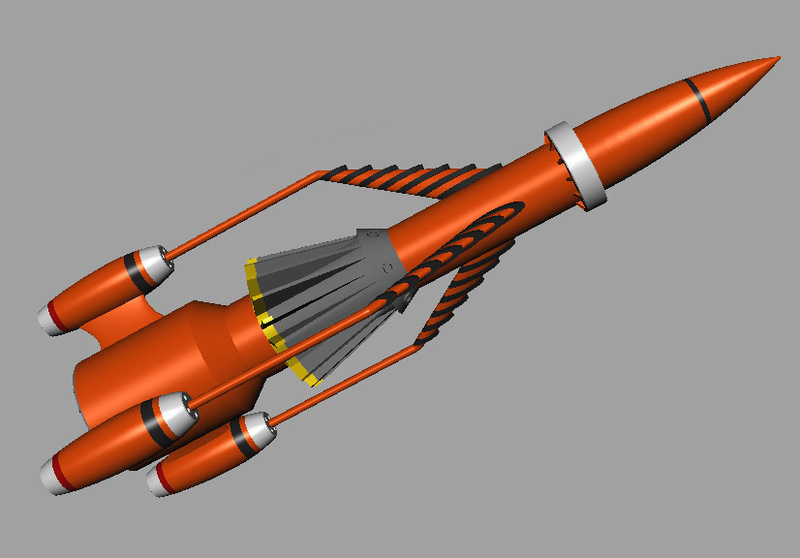 Back then, before modeling this variation, I also modeled the original Thunderbird 3. I still have those old Lightwave files, so I had a friend at work convert it to an .FBX file so I could import it into Maya and pick up where I left off. I decided to update the model for printing. 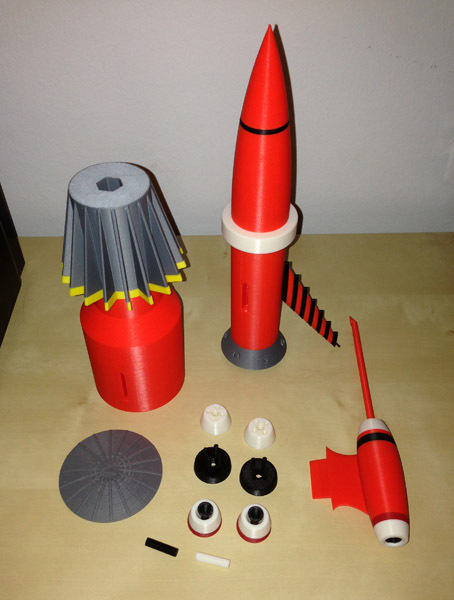 And while I am currently working on a secret commission (which I will certainly talk about when I can – nothing huge, but very interesting) I took a bit of time to test-print some parts. The original model was made for rendering, so it wasn’t overly smooth around. It had something like 24 vertical cuts on all cylindrical shapes. So I vastly increased that so I would get a nice, smooth print, and proceeded to redesign the whole thing from scratch using the basic shape of the original old model. I tried this orange, but it’s way too neon orange. And I tried red, but it really isn’t supposed to be red either. In fact, that one red stripe at the bottom of the engine is supposed to be red, and visible against the darker orange that TB3 should be. 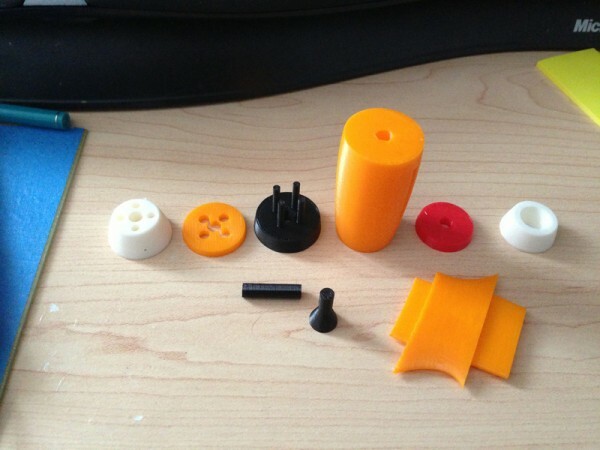 So I ordered a red-orange filament, and when it comes in I will reprint the orange pieces you see here and post new pics. Hopefully that filament will do the job. I’d rather make this of native colors than paint it, but if I have to paint it to get the right tone, I will. I spent Independence Day weekend completely re-arranging the home office space. 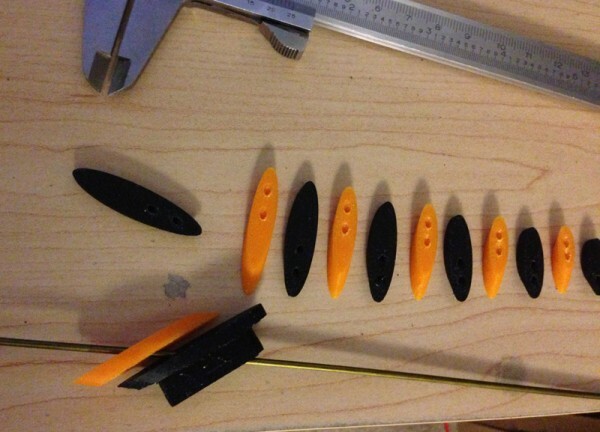 I didn’t have much time to model, but I did remodel the upper engine arms to make the pips more accurately spaced. I split the arm out into individual parts, then modeled a wire rod and cut holes in the arm pieces. 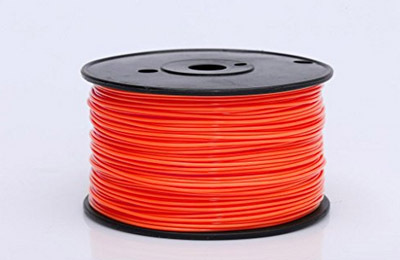 I’m really curious to see how my red-orange filament I ordered turns out. And what the final model will look like. The next updates here will be showing the model printing in progress, since the computer modeling is now finished. I got the new filament in the mail yesterday. When I opened it I was a bit disappointed. The color was called “orangered” on the website, and of course web photos can’t be trusted. But to me it seemed way too red, and not as orange as I would have liked. I put it up against my normal red reel and I didn’t see much difference. Also, a bit of a snag – this is a one pound reel, which is non-standard. Usually reels come in 2 pound reels, and the reels are bigger. Afinia Premium comes as 1.75 pounds on a thinner, but larger reel. But the problem was in the spool’s central hole. It was much smaller than I have ever seen, and the first thing I had to do before using this reel was print a new reel holder that I had to model to fit the new reel. How meta. 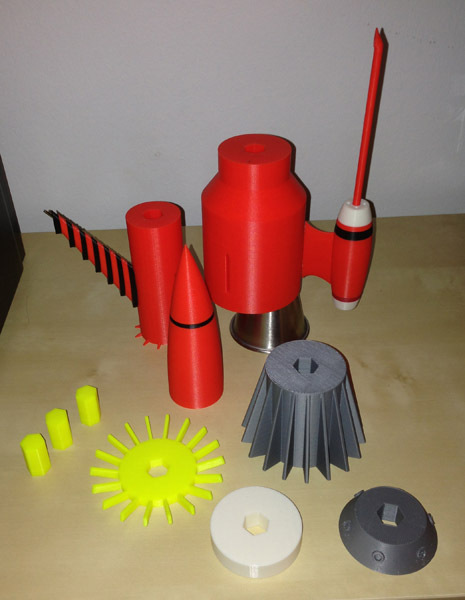 But I redesigned my own spool holder to hold this new, small reel, and re-printed the engine pieces I showed earlier. 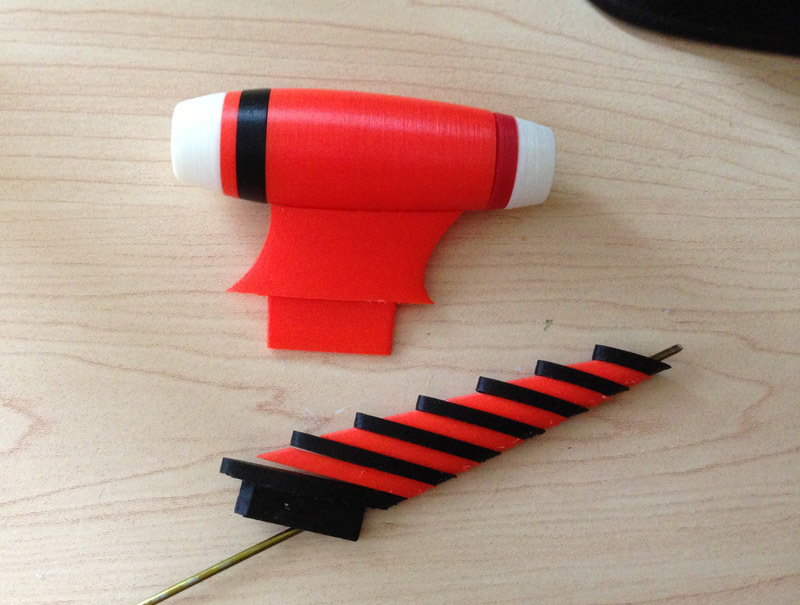 Then I re-printed the arm pieces. I think my initial assessment of the color was a bit premature. It’s going to do fine. Here is the engine from the top. The black stripe has rods that protrude into the four intakes, and you can see the black here (though the picture is a bit out of focus.) I may lengthen those rods to bring them closer to the surface. 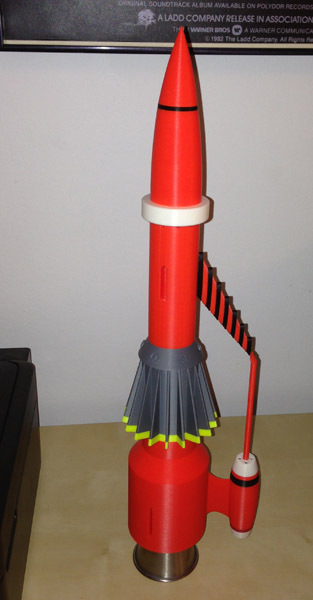 I just finished a fairly large 3D printing commission, 30 [redacted]s printed in 3 colors, in 15 pieces each, and one small screw. The last 10 went through the assembly line today. 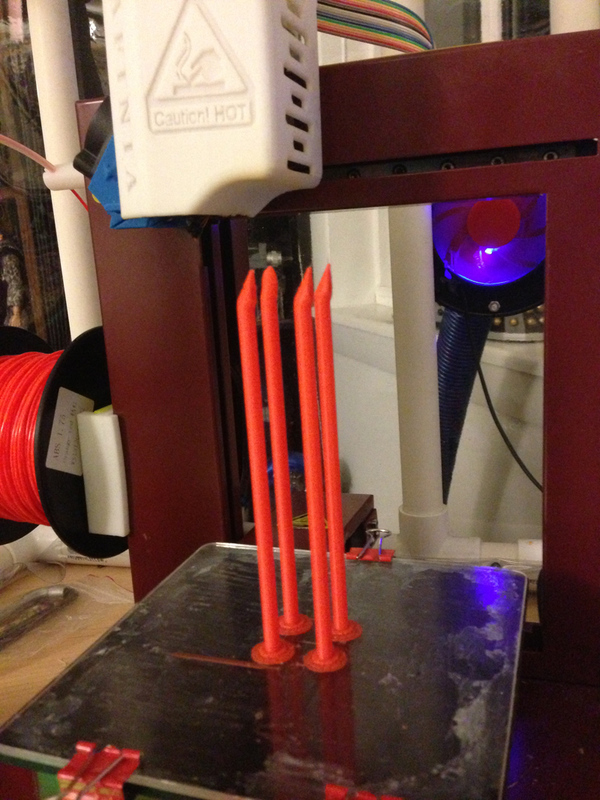 Then I finished printing four rather long prints for a project at work. 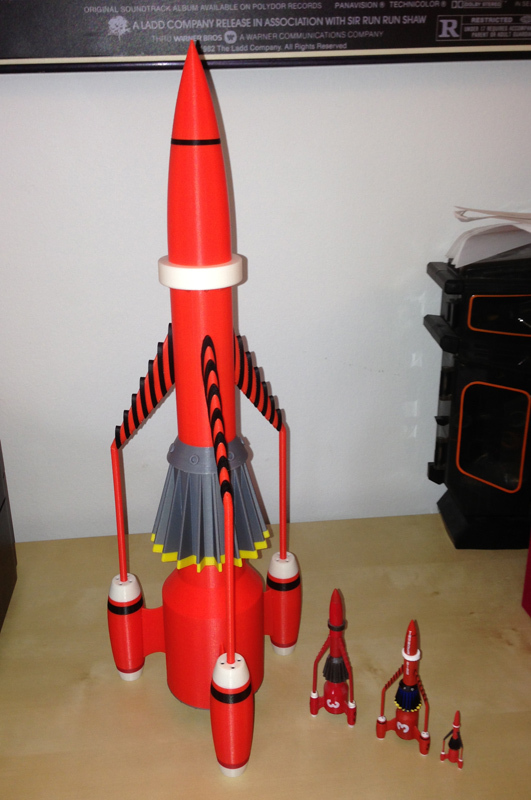 So I was freed up to do some more of my Thunderbird 3 today. 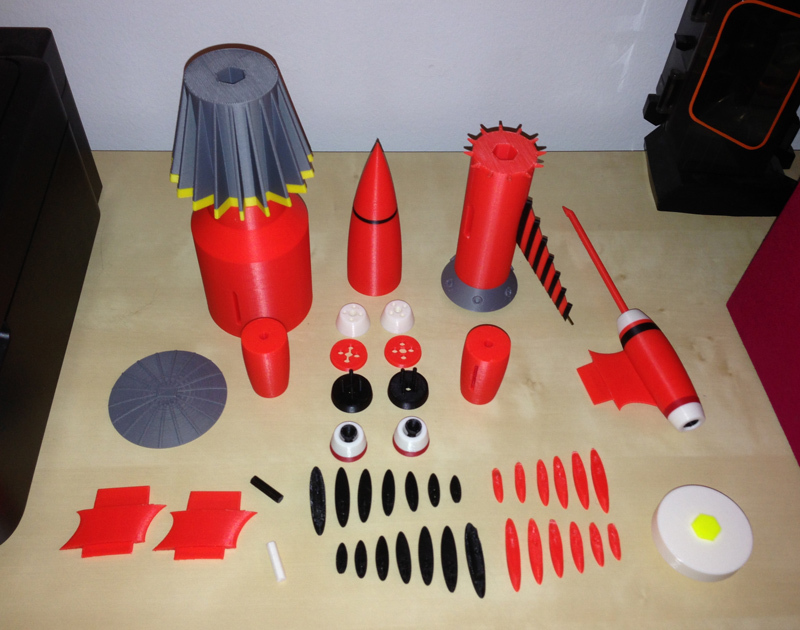 I printed four engine posts (one safety) in red-orange, and glued the engine together. Here is the full engine assembly, from engine body to upper arm, shown fitted together. You can see one metal wire (a coat hanger segment) sticking out the top. A second one will go on there for stability. The wire above the arm will fit into the body for even more strength. The hexagonal openings are for a rod that I will use to fit the pieces together and ensure alignment. Last nigh I printed the docking ring, the yellow lower fins (though in the wrong yellow – as a test print I use my neon yellow), the central fins and central ring, and the connector posts. The only thing left to print is the bottom cap, and two more arms. And here it all is, put together, with one arm in place, though I haven’t filed down the metal post enough to fit the arm post into the arm yet. And the bottom cap is not yet printed. Here we get closer to the end. 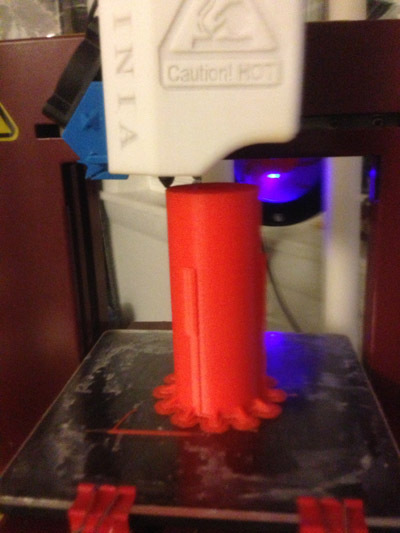 The bottom cap is printed (showing the true weakness of 3D printing in layers, since it really accentuates those layers) and getting the other two engines printed. 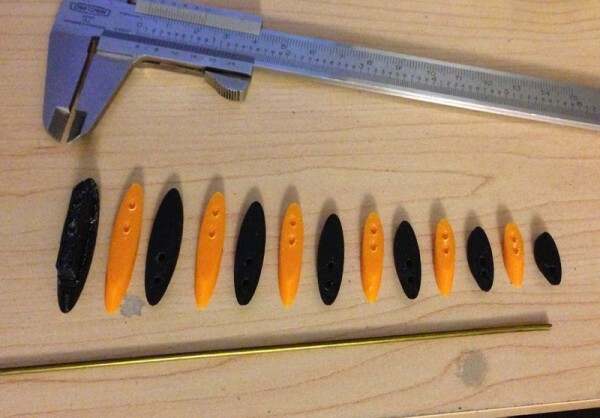 83 parts. (Not shown are the other two arm posts. I forgot to put them in the picture. BTW, The arm posts are interesting. My printer has what is generally considered a 5x5x5″, (just a bit over 12.5×12.5×12.5cm) print volume. These posts are, in their final form, 4.85″ (12.3cm) in height. So I had a bit of room. But note their thickness. These are thin posts. Yet this printer was able to churn them out without deformity. 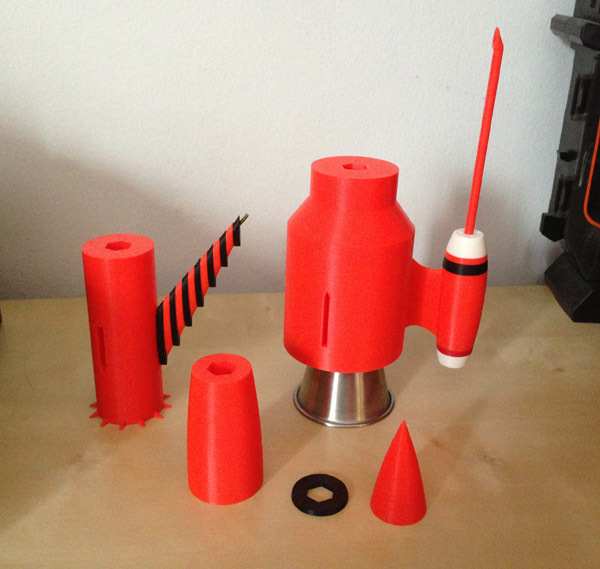 How this printing process works is a layer is printed down by a hot extruder head, melting plastic and pushing it out of a nozzle in exactly the same way a glue gun works. 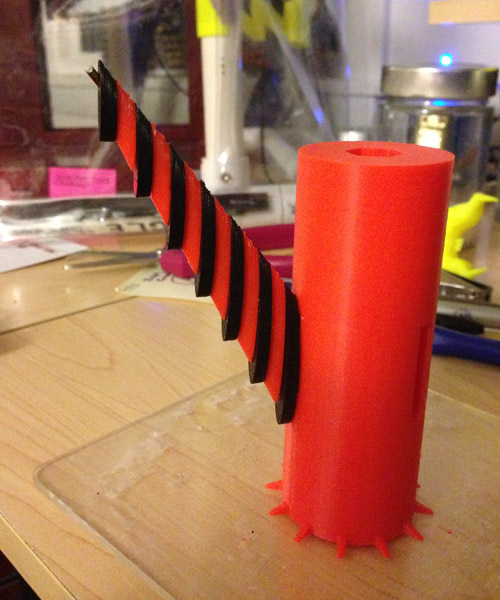 I printed the conical cylinder at the top of the vanes wrong. The intakes were at the wrong angles. 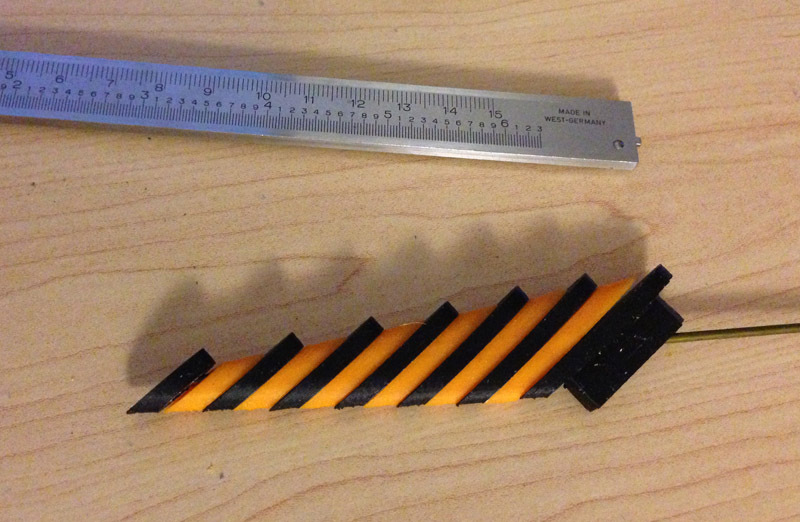 With the hexagonal slot in the middle for alignment, I couldn’t just arbitrarily rotate it. I checked my model and sure enough, I had modeled them at the wrong angles and never noticed. 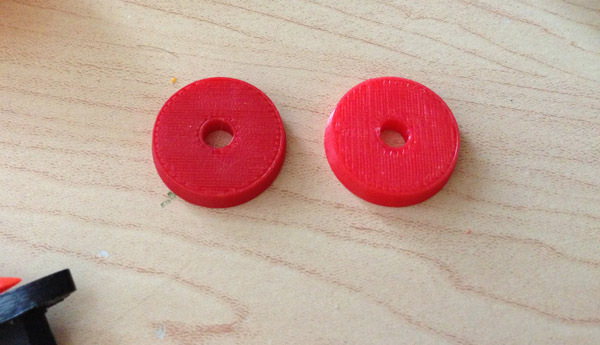 So I aligned them and printed the part again. 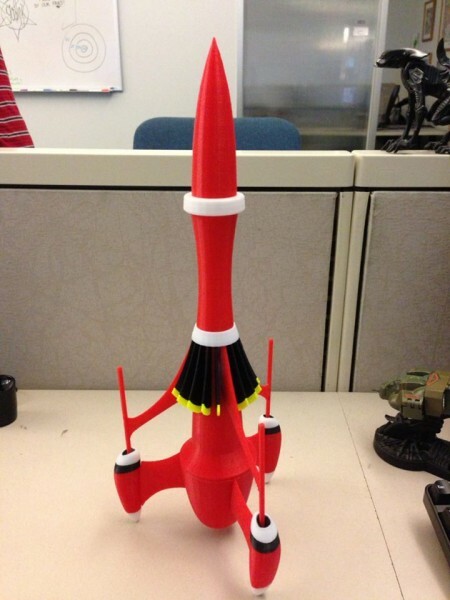 Now the intakes were prefectly in line with the arms – which is wrong! 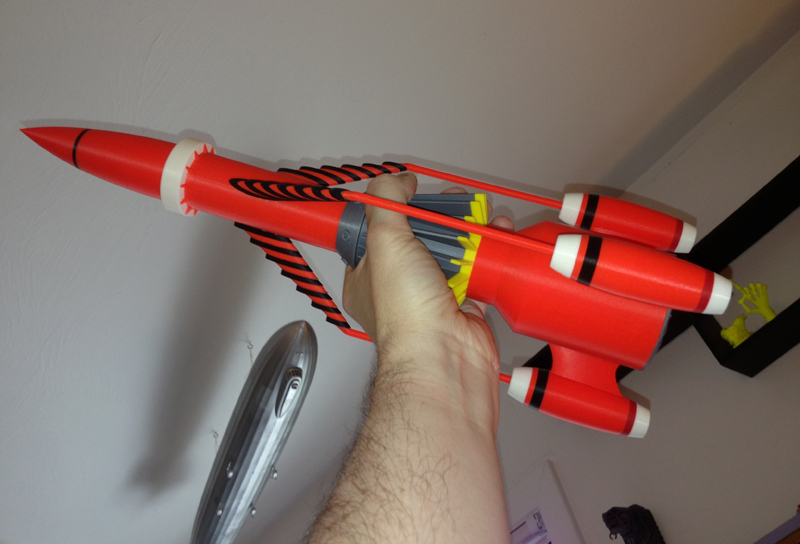 So I rotated them to be between the spans of the arms, and re-printed. But somehow I must not have unloaded and reloaded the model because I printed it a third time, exactly as I did the second, which was wrong! I just got my Zen Toolworks Silver spool (my Inventables silver was becoming quite problematic, clogging at the low temperature, and becoming unmanagably hard to remove from the support material in the high temperature, and giving me an uneven flat surface) and printed it with the new filament. It printed right this time, and better than the older filament. 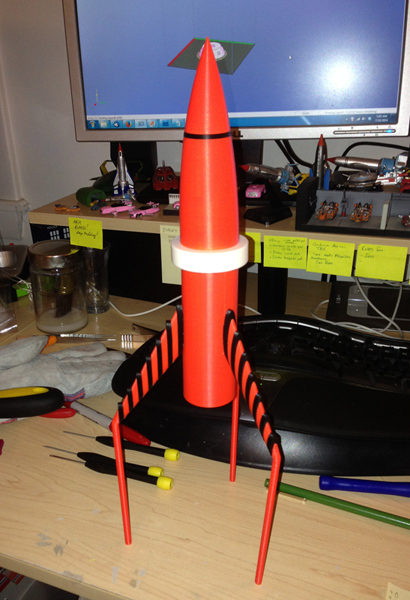 After doing that I test-fitted the three arms on the model, to make sure they fit. This is because I knew I would have to Dremel down the coat hanger wire that protruded from the arms to fit precisely inside the hole in the arm posts. So this morning I assembled the whole beast, and I’m proud to show it off. Here it is, with several of its younger brothers. (Matchbox, Konami, and a very tiny one that comes with a Thunderbird 5). I bought some white Testors water-slide decal paper, which I have used in the past for small decals. I designed and printed the decals for Thunderbird 3. 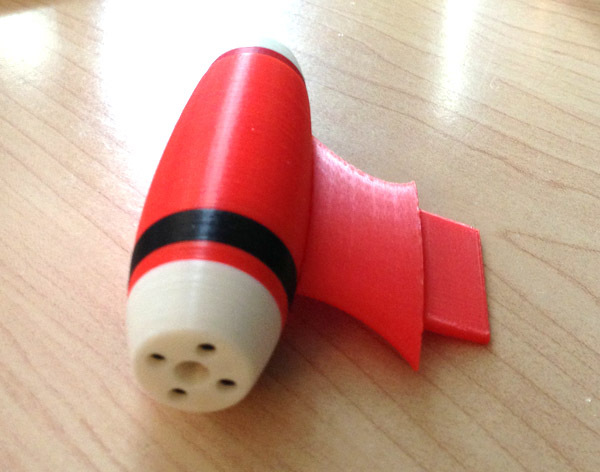 Since the rocket needs white text, this can only be printed on white decal sheets. Clear won’t do, since no printer prints in white ink. So I had a clever plan to print the letters with orange in the background so I could cut the letters close to the edge and let some orange bleed over. This would look good and work. Sure. The trick was in getting the incredibly thin, wet decals on the body without them folding up like sheets in a brothel. It was impossible. 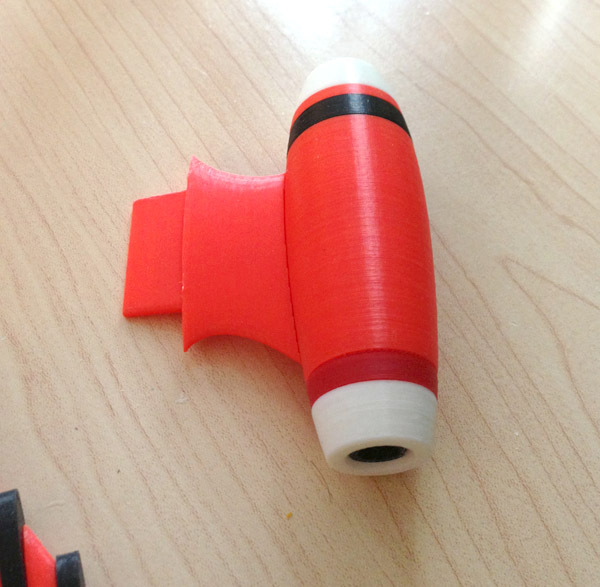 But I also printed the black 3s (for the engines) on clear decal paper and that worked fine. But what to do about the white text? 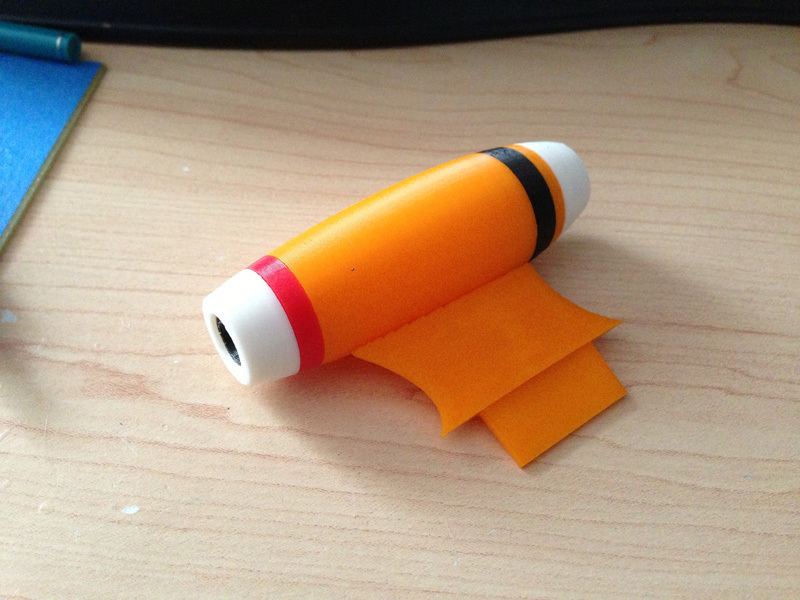 So instead of using decal sheets I went with glossy sticker paper, using the orange background idea. 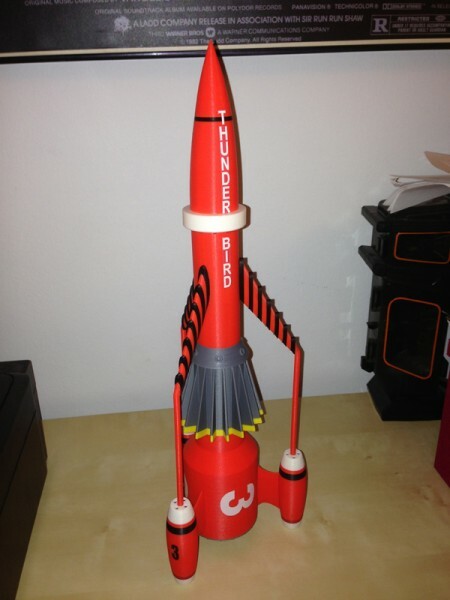 I carefully cut out the main 3s and the THUNDERBIRD, and stuck them to the body. They peeled up at the edges. Not permanent sticker sheets, apparently. 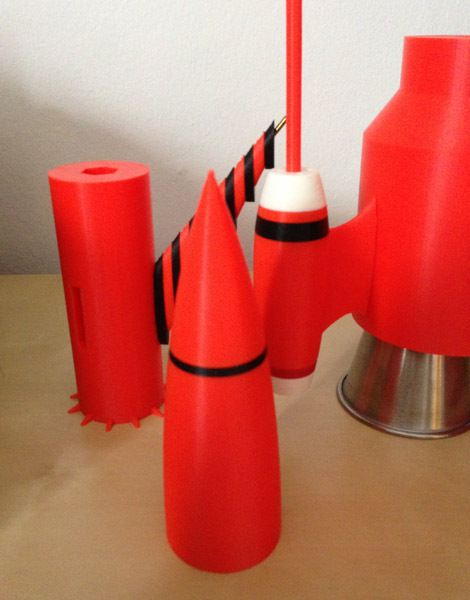 So I used some Elmer’s permanent bond spray glue and stuck them to the rocket. The result isn’t bad. I couldn’t cut out the individual letters for THUNDERBIRD, since they would be too complicated, so I did HUNDER and BIRD as a block, with orange background. The T had to be cut out since it crossed over the black stripe, and had to look right doing so. Anyway, the result was better than expected. Here it is, finished. (Well, there is some debate as to whether there is only one THUNDERBIRD going down the body or three. Some say three, so I will add the other two.